Cauliflower Au Gratin is an elegant french recipe. The cauliflower is combined with white sauce, cheese and seasoned with Italian flavors. Au gratin means "sprinkled with grated cheese and browned." Even the pickiest of eaters will love this comfort food.This will make you prepare again & again ! 1). In a pan add enough water to steam the cauliflower over med-high heat and bring to a boil. Season with salt and add cauliflower. Cook until tender but still firm for about 3-4 minutes. Drain and keep it aside. 2). Preheat the oven to 375 degrees F.
3). Preparing white sauce :- Melt butter in a heavy pan, over low-heat. Blend in the flour with a wire whisk and gradually stir in milk, whisking constantly till the mixture thickens. It takes about 3-4 mins. Then add salt, garlic powder, paprika and pepper powder. 4). Coat the oven proof dish with cooking spray / butter and place the drained cauliflower. Sprinkle a little bit of the shredded cheese uniformly over the florets. 5). Now pour the white sauce over the spread cauliflower and finally sprinkle the rest of the shredded cheese over the sauce. 6). Bake it for 20minutes until you get a nice golden topping. # Don't overcook the cauliflower. You could use frozen cauliflower too. # Other veggies that you could include in this recipe are corn & broccoli. # I have used garlic powder only for the flavor, u can avoid if u don't like it. 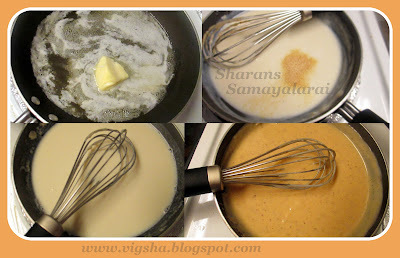 # Use wire whisk for preparing white sauce. Make sure to whisk properly without any lumps. # Be careful while preparing the white sauce, keep in low-flame. Do not allow the mixture to brown. # Arrange the florets on the oven-proof dish with head facing upwards. # Instead of preparing white sauce, you can use beshmal sauce which is available ready-made. # You can substitute potato or broccoli florets instead of cauliflower. 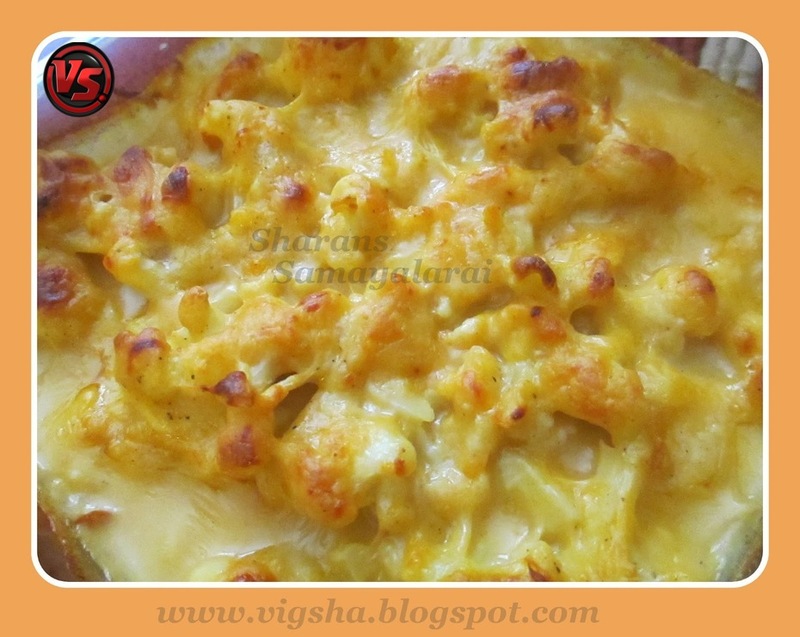 Such a creamy n cheesy dish...very tempting. Looks so yummy and tempting...this is new to me.